Washington - No. 1 office supply chain Staples and smaller rival Office Depot Inc said they terminated their planned merger on Tuesday, after a U.S. federal judge ruled to temporarily halt the deal pending a full regulatory review, citing antitrust concerns. Shares of Office Depot plunged 26 percent and shares of Staples fell 10 percent in extended trading following the judge’s ruling. Judge Emmet Sullivan of the U.S. District Court for the District of Columbia, in a three-page order granting the Federal Trade Commission’s request for a preliminary injunction, said the agency had shown there was a “reasonable probability” that the merger would “substantially impair competition” for the sale of office supplies to large business customers. He said he would publish an opinion under seal on Wednesday. The FTC filed a complaint in December aimed at stopping the deal, arguing that it was illegal because the two companies were each other’s biggest rival. It said the two companies sell 79 percent of the pens, paper, file folders and other “consumable office supplies” sold to Fortune 100 companies. The FTC had asked for a preliminary injunction to stop the proposed $6.3 billion deal pending a hearing by an FTC administrative judge. To win that injunction, the government was required to show that the proposed acquisition would hurt consumers in the form of higher prices or lost innovation. have further crowded the market. 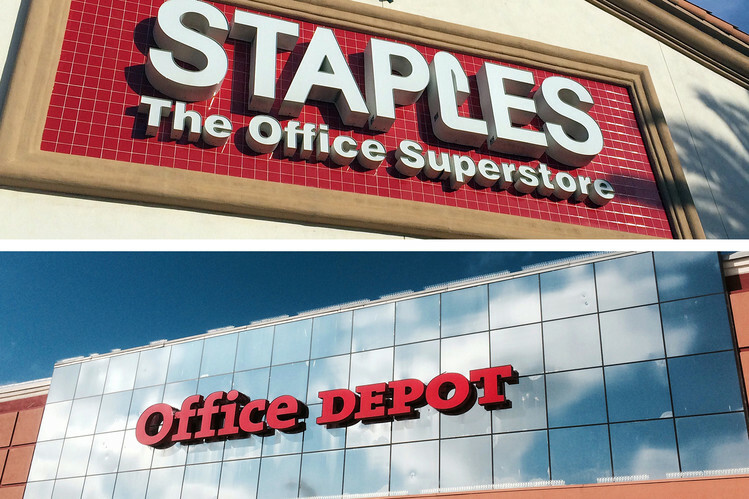 Staples was emboldened to offer to buy Office Depot after the smaller chain succeeded in buying No. 3 OfficeMax in November 2013 with no divestitures. The case is the Federal Trade Commission et al v Staples et al. It is No 15-2115 in the U.S. District Court for the District of Columbia.